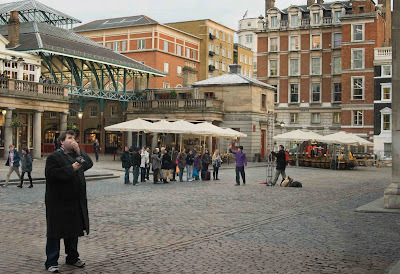 Covent Garden and artists go hand in hand. Artists, theatre, musicians, buskers, poets, the list goes on. This weekday afternoon a busker is drawing the crowds in for his performance. A photographer is contemplating his next shot. In half an hour it will different. Never a dull moment here. What a great spot to hang out! love it! Looks like a great place to spend the day! love this picture... and miss london terribly! thanks for sharing. Always something going on here. A great place for street art.